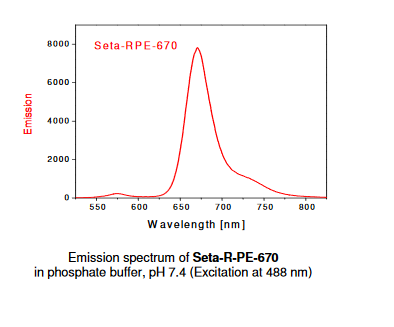 Seta-R-PE-670 is an extremely bright and photostable tandem conjugate between R-PE and a red-emitting Seta dye. Comparable tandems: PE–Cy5, PE–Alexa 647. For more information we refer you to the specs sheet (above) or the flow cytometry page.